John Ashbery is gone. A pivotal figure in 20th– and 21st-century literature, few poets have been as honored as he: recipient of the Bollingen Prize, the National Humanities Medal, a MacArthur “genius” grant, and numerous other awards. His 1975 collection, Self-Portrait in a Convex Mirror, won the American book world’s triple crown: the Pulitzer Prize, the National Book Award and the National Book Critics Circle prize. Noted for his wordplay, for combining everyday expressions with high classical references, his poetry was sometimes described as elusive, challenging, puzzling, or surreal, but no one denied its brilliance, and it has proven deeply influential to the next generation of poets. 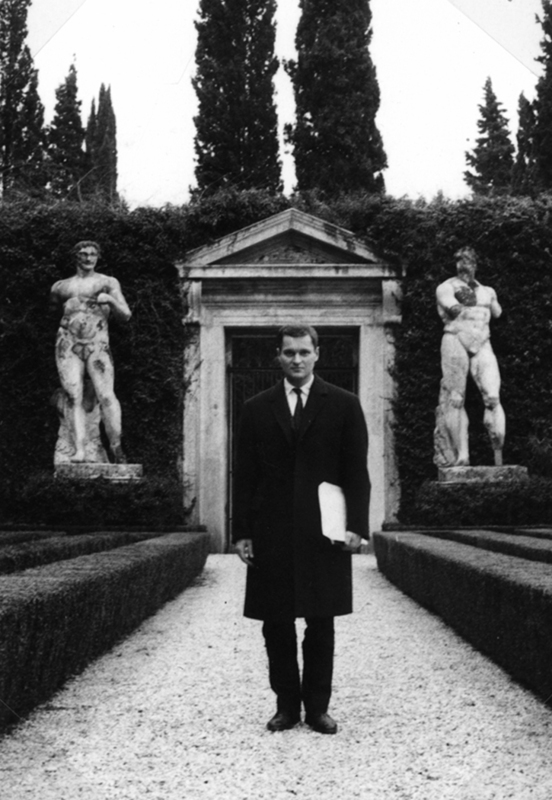 John Ashbery in Rome at the Villa Madama. Photographer unknown [possibly his friend Fernando Sacco], 1963. From the John Ashbery papers (*89M-58, box 49), Houghton Library, Harvard University. His Harvard ties were deep, beginning with his time as an undergraduate (class of 1949), where he began life-long friendships with fellow poets Frank O’Hara, Kenneth Koch, Barbara Guest, and Robert Creeley. His interest in poetry was nurtured by attending campus poetry readings by W.H. Auden, William Carlos Williams, Marianne Moore, T.S. Eliot, and Wallace Stevens, and he chose to write his senior honors thesis on Auden. And Auden just happened to be the judge who awarded Ashbery the Yale Younger Poets Prize for Some Trees, an award that launched Ashbery’s career. Perhaps remembering his own undergraduate experience, he was generous in giving many readings on campus as his fame grew. He gave the prestigious Norton lectures at Harvard in 2000, and received an honorary doctorate from the University in 2001. He was awarded the Harvard Arts Medal in 2009, and the Harvard Film Archive celebrated “John Ashbery at the Movies” with the poet’s commentary on some of his favorite films. At Houghton, Ashbery’s papers are one of the pillars of the Library’s American poetry collection, along with T.S. Eliot, Wallace Stevens, and Robert Lowell. Papers of his artist friends, Jane Freilicher and Nell Blaine, provide added depth in considering Ashbery’s relationship with the contemporary art scene. He was a noted art critic, and allusions to art, and the subject of art, recur throughout his poetry. 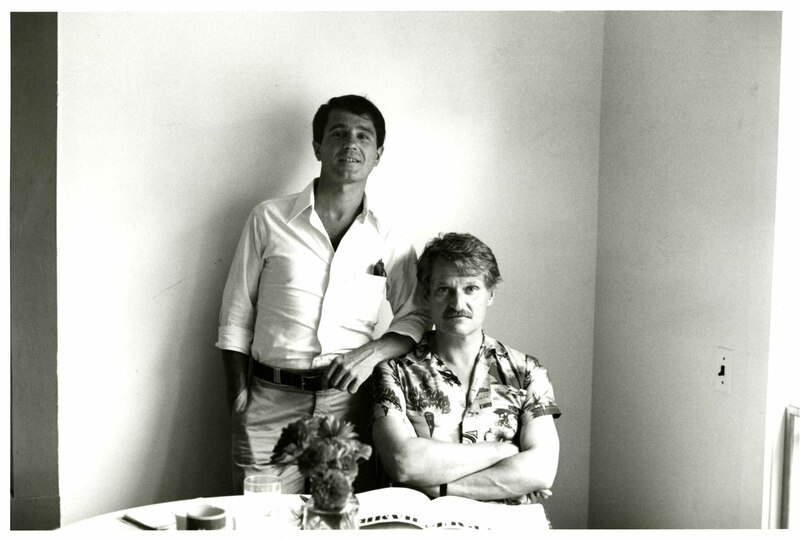 David Kermani and John Ashbery. Photograph by Clarice Rivers, Summer 1977. © Clarice Rivers. From the John Ashbery Papers, (*89M-58, box 49), Houghton Library, Harvard University. Leslie A. Morris, Curator of Modern Books and Manuscripts, contributed this post. Leslie Morris’s In Memoriam keeps John Ashbery alive. He and we are fortunate that his papers will be preserved at Houghton where his great words and insights will be available to all forever. Ashbery will live in hearts forever. He was able to describe poetry that he felt.